Charlie James has been in the insurance business in Milwaukee for over 60 years, having earned his “wings” from UW Madison back in 1954. He landed a job in Milwaukee after graduation working for Northwestern National Insurance Company as an underwriter, joining a long lineage of family members as the 5th generation James in the business. Charlie’s great grandfather started with NN in 1872, after he was hired for his exemplary service in handling claims from the Great Chicago Fires of 1871 while working for Fred S James. He later became president of NN, and started the family succession of NN presidents and leadership. Charlie is proud to have his son Todd working with him and representing the 6th generation insurance professional in the family. Charlie left NN and ventured out on his own in 1966 to start the Charles V James Agency, later merging with Goetz-Haessler, becoming Goetz-Haessler-James, and eventually Rollins Burdick Hunter in 1979, later AON. 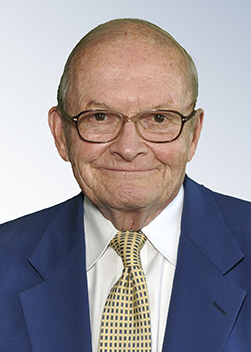 In 1987 Charlie purchased Fitzgerald, Clayton, Noyes and Kasten, becoming Fitzgerald, Clayton James and Kasten, Inc. (FCJK). In 2006, son Todd succeeded Charlie as CEO of FCJK, then in 2011 affiliated with Robertson Ryan & Associate’s Mequon office location. Charlie’s experience and keen eye for business opportunities helped him bring the concept of Mortgage Impairment coverage from London to the Midwest, contracting with Lloyds in 1966 to eventually provide the coverage for most Banks and S&L’s in Wisconsin. MI eliminates the need for lenders to check the Mortgagor’s insurance annually. As the concept grew, other players came into the market, but the model that he imported from England formed the basis for MI throughout the Midwest. In his civic life, Charlie has always been actively involved in the Milwaukee community, through both his business leadership and philanthropic contributions. His commitment to organizations like the Milwaukee Boys & Girls Club, where he is currently trustee, includes years of dedicated service and managerial expertise as President, Director of Camp Whitcomb-Mason and Co-Chair of the President’s Club. Passionate about animals and wildlife, Charlie currently serves on the board of the Wisconsin Humane Society and is Trustee Emeritus for the Nature Conservancy. Other prior board and leadership contributions include Milwaukee Rotary Club, University School of Milwaukee, NN Foundation, Milwaukee Club, NN Corporation, Friends of the Museum, Fox Point Foundation, Riveredge Nature Center, Village of Fox Point, Fox Point Lutheran Church, Town Club, Hillsboro Club, Coleman Lake Club, 1000 Friends of WI and Lakeside Centre Condo Association where he is president today. Charlie and his wife Carol reside in Fox Point, WI, where they raised 3 children and now enjoy being grandparents and great-grandparents to 10 grandchildren and 6 great-grandchildren! Both Charlie and Carol are actively involved in their community as members of Fox Point Evangelical Lutheran Church, Immanuel Presbyterian Church, Milwaukee Rotary, Town Club, Milwaukee Country Club and the Hillsboro Club, Pompano Beach, FL (they occasionally escape from Wisconsin Winters). Charlie lives for fly-fishing in the great north woods and continues to improve his swing at the golf course.